Automatically backup your saved games with optional cloud support. Cloud support requires any service that offers a folder synchronizing client. GOG Galaxy recently implemented DOSBox cloud saving. It accomplishes this by using a new version of DOSBox that allows redirecting saved game outputs from DOS games to a specific cloud folder. Unfortunately, this will break most of the GOG DOSBox configurations currently being used in GBM. Modify any GOG DOSBox configuration(s) in the Game Manager to use the new saved game path, which would be ..\cloud_saves. I'm still not sure when or if the official configurations will be updated to reflect this new path. Edit the DOSBox conf file used to launch the game (Ex. dosbox_biomenace_single.conf) and remove the autoexec command that mounts the overlay folder. mount C "..\cloud_saves" -t overlay. The manual has been updated to include features added in v1.1.8. Game Backup Monitor wouldn't be possible without these free products and services. 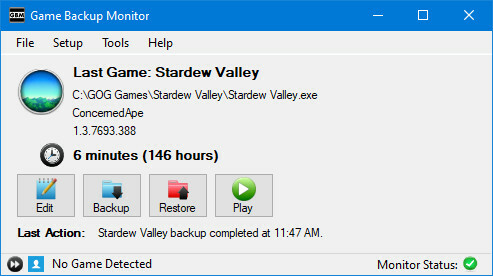 Game Backup Monitor is certified 100% malware free by Softpedia.